In this tutorial we will investigate gene reporters and reveal information R2 (http://r2platform.com / http://r2.amc.nl) is providing based on the genome location. Explore gene expression reporters in the genome browser in combination with gene expression profiles (from the one-gene-view). In the main menu select in field 2 the default dataset “Tumor Neuroblastoma public - Versteeg - 88 - MAS5.0 - u133p2”. In Field 3 choose “View a gene” at “type of analysis”. In field 4: type “MYCN” and click ‘next’. Leave all the settings at their default and click ‘next’. You have now arrived at the “One Gene View”. In this tutorial the main focus is the evaluation of the reporters designed by manufactures such as Affymetrix represented in the R2 Genome browser. To a lesser extent gene expression wprofiles will be looked at as well.When you slide down on the “One gene view” page of the MYCN expression, you encounter the “Probeset verification” table. 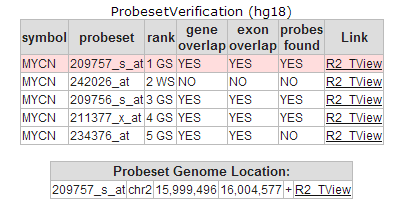 The Probeset verification table, displays an automated analysis for U133 based Affymetrix platforms, where the reporter-gene relation validity has been verified by their genomic location (also described in more detail in the tutorial on One Gene View). 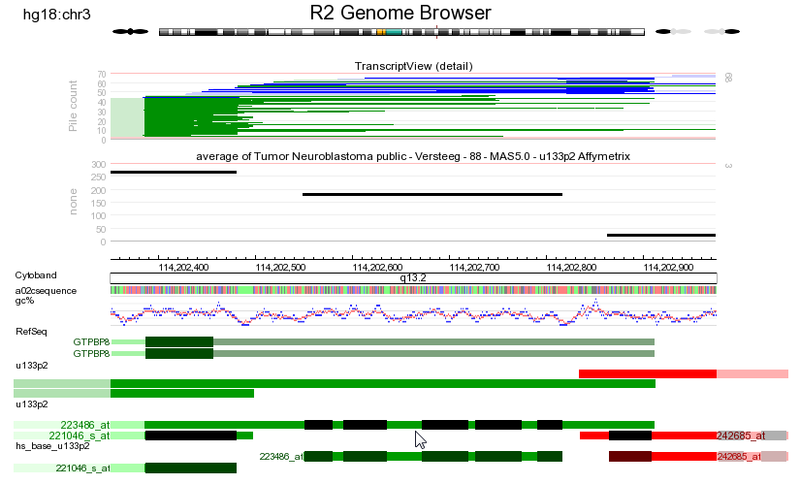 Click on the “R2 Tview” link of the upper probeset and the embedded R2 genome browser will open in a new screen. The genome browser shows the genomic span where the MYCN gene is located together with the 5 MYCN probesets mapped to their genomic position. When we access the genome browser via the One Gene View page, by default R2 has enabled a number of annotations (Tracks). At the top of the Transcript View display, R2 depicts all known expressed sequence tag (EST) and mRNA sequences aligned to the genome (synchronized with the USCS database regularly). These mappings serve as evidence for the existence of a gene, and are individually hyperlinked to the Genbank database. The EST and mRNA sequences are colored by the orientation of alignments, as determined by exon-intron junctions and poly-A signals to the genome. Here, green alignments indicate a 5`-> 3` mapping on the positive strand of the genome, while a red mapping represents a 5`->3`mapping on the negative strand of the genome (reverse complement orientation). In sequences where no information on the orientation is encountered, the alignment becomes blue.Underneath the plot the NCBI curated records for transcripts for the gene of interest are shown as reference sequences (RefSeq). The structure of the reference sequence has been indicated. In this MYCN example, the gene as represented by the different isoform refseqs, is green. This tells us that the MYCN gene maps to the positive strand of the genome, and should be read 5`->3`from left to right.The shadings in green, for the separate EST and mRNA mappings, indicate exon (darker) and intronic (lighter) regions (Figure 3 shows a legend to all the different color shades).If we look at the reporters underneath the refseq tracks, we see that most of them are green as well (thus mapping to the same strand as the MYCN gene). However, the 242026_at reporter appears in red (thus mapping to the negative strand), and thus cannot measure MYCN expression. Furthermore, this reporter maps at the intronic region, which is another reason not to use this reporter to represent MYCN. Still, this reporter is annotated to measure MYCN by the Affymetrix company.Below the EST and mRNA mappings, you can see the average gene expression for the reporters in the neuroblastoma dataset that we are investigating. This panel can be handy to check which reporter shows the highest expression (and often is the preferred reporter to use). Since the U133 platforms of Affymetrix are 3`based, you can nicely see that the reporter signals are higher at the 3`end of the gene. The 209757_at reporter is the most informative here, and was also picked by the hugoonce algorithm, embedded in R2.For Affymetrix arrays a probeset by itself is a collection of separate 25-bp reporters. For Affymetrix arrays other then the Hu133-2 and Hu133-a platforms the reporters may vary in the number of basepairs. These measured regions are indicated in the reporter track by very dark shades. Figure 2 : Genome browser with default tracks. 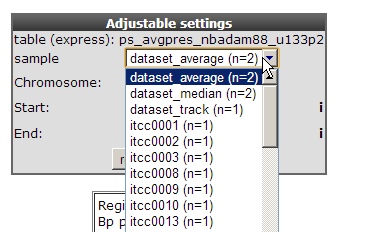 With the default settings the genome browser shows the average expression signal per probeset for a chosen dataset with their genomic location. The properties and adjustable settings panel allows users to configure the graph display in various ways. In the left properties panel set in the transcriptview section “draw mode” to count and in the expression section “draw mode” to bars. The expression level can also be investigated per sample. The one-gene-view plot shows that ITCC0030 has no MYCN amplification resulting in low MYCN expression levels to illustrate this in the genome browser select in the Adjustable Settings panel, ITCC0030. Click redraw. The picture now shows for one sample the expression levels for all MYCN probe sets in a more simplified fashion with barplots. Note the extra annotation tracks which were selected and hover over the tracks to reveal extra information. 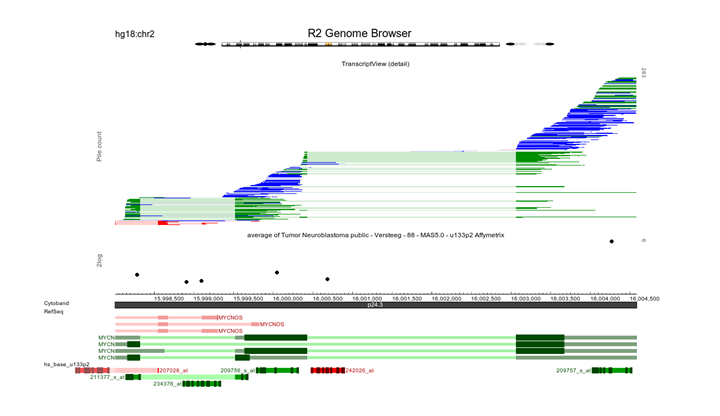 The R2 Genome browser is a highly interactive application offering several ways to zoom and scroll the genome display. Sometimes it could be useful to zoom into a location such as an aligned probeset. To quickly zoom into a specific region of interest, use the browser’s “drag and zoom” feature. At a desired position click and hold the left mouse button and drag the highlighted window to a second position and release the mouse button. The selected ‘white’ region, can be repositioned (cross mouse indicator). A selection can be cancelled by clicking in the dark regions (Do note however that the positions of the selection were already adapted though ). Also in the track panel set “sequence and GC” windows to on. Click redraw in the middle panel. At a larger magnification certain features such as basepair pair coloring at the sequence annotation track may become visible. Note the black rectangles in the dark green exon region a collection of the probes which form together a probeset . Repeat the same drag and zoom procedure for one probe and click redraw. Now the actual sequence is revealed a single affymetrix probe is matching. Clicking on the refseq bar will automatically zoom out to the genome browser representing the complete gene. Did you know that the additional settings can be changed in “Tracks Panel”. The Genome browser offers various options to zoom into a certain region. In case there is an interest in gene expression levels of a certain region on the chromosome. This can be quickly done by clicking on the chromosome at a certain location. Click at a certain region on the chromosome and a new graph will be generated with average gene expression levels for the selected dataset in that region. Furthermore it’s worth mentioning that in order to use the genome browser it’s not necessary to do so via first selecting a dataset. The genome browser can directly be accessed from the main menu including many basic functionalities. In some instances, genome tracks may list a whole array of samples, that can individually be selected for display. If R2 has the ability to also display multiple samples for that specific track, then the items ‘all’ and ‘custom’ will be represented in the sample dropdown list as well. The first does not require further explanation, however the ‘custom’ option probably does. If you select ‘custom’ as the sample to view, then R2 will listen to the ‘custom_id’ field at the bottom of the tracks box. Within this box, you may enter the sample names that you would like to view. samples should be separated by a comma and may include the % sign as a wildcard. In most tracks the samples will be visualized in the provided order. By using the ‘edit’ button next to the ‘custom_id’ field, you can make populating the ‘custom_id’ box a lot easier. The R2 Genome Browser can be used with different genome builds (versions). Depending on the build, different annotation tracks can become accessible. In addition, depending on your access, additional tracks may be at your disposal. We hope that this tutorial has been helpful, the R2 support team. © Copyright 2019, R2 support team, http://r2.amc.nl - http://r2platform.com Revision 9f522207.